I finally read the final copy of The Cruel Prince (I read the ARC last October) and it just reminded me how much I loved it. So naturally, I had to review it! (Plus I just read The Wicked King and I’m dying!!! I’ll be reviewing that closer to it’s release). Review in a Nutshell: The Cruel Prince is a beautifully dark novel with morally gray characters and a beautifully magical world filled with deception. 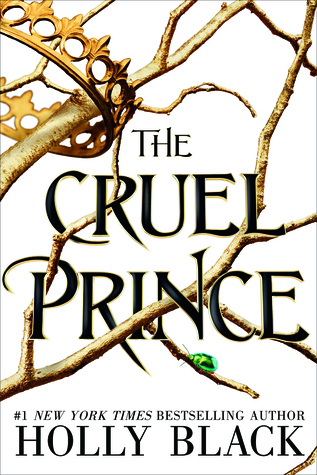 The Cruel Prince follows Jude Duarte. After witnessing her parent’s murder as a child, she was taken by their killer to Elfhame, and raised with her sisters among the fey. She is desperate to prove herself and find a place in a society that despises mortals. The youngest Prince, Cardan, has other plans. He is determined to make her miserable. This book is full of political intrigue, action, and betrayal at every turn. Elfhame is three islands off the East Coast of the United States, home to the Folk. Holly Black has created a beautiful world where the magic hides the horrors inside. There are so many intricate details built into this land, various creatures and rules, but it never feels too heavy with exposition. The Cruel Prince has the perfect balance of atmospheric writing, believable dialogue, and entertaining moments to bring levity to the darkness. The writing is absolutely amazing, and the prose is gorgeous and while maintaining its flow. The plot of this book is epic. There are constant twists, and whenever you think you know how it will end and what will happen, something changes. The Cruel Prince keeps you on your toes between the various action scenes, betrayals, and schemes unfolding. The characters are where this book goes from great to amazing. Jude is a complex and intriguing protagonist who’s motivations walk the line between good and selfish, yet she manages to be extremely likable at the same time. Her relationship with her family is fascinating to watch, especially with her father figure, Madoc, the man who she witnessed killing her birth parents. I loved him as a character. However, it was Cardan who stole my heart and is my favorite character. He’s unapologetically awful and cruel, yet there’s so much more to his personality and backstory! This book has made me absolutely adore devious, cunning, and heinous characters and I love it so much for that. I haven’t even mentioned Locke, Vivi, and all the other characters who were so interesting and well developed! Not to mention, there’s some great LGBT rep in this book that made me so happy!! The Cruel Prince is an alluring, dark fantasy that will show you the terrible faults of magic but still have you wishing for it. Thank you! I really hope you like it!